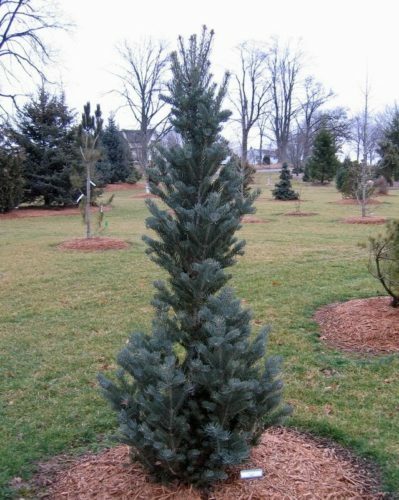 Abies concolor 'Conica' is a slow-growing, dense, narrowly conical selection of White fir with strongly fastigiate branches. 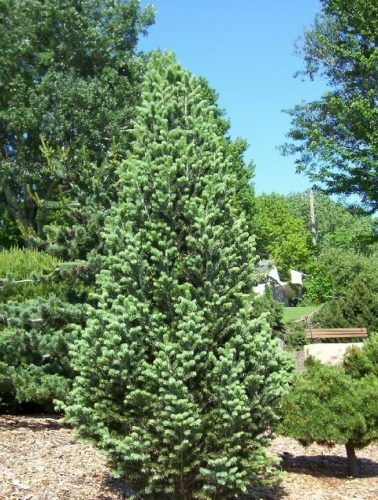 Foliage is gray-Blue in color and and needles are only 1 inch (2.5 cm) long, shorter than is typical for the species. Annual rate of growth is 4 to 6 inches (10 - 15 cm) per year, making a mature plant that is 4 to 5 feet (1 - 1.3 m) tall and 12 inches (30 cm) wide after 10 years in the landscape. This cultivar originated as a unique form found in 1923 by B.H. Slavin in the Durand Eastman Park, Rochester, New York. 1938, was 11 (3.3 m) tall and 8 feet (2.2 m) wide. Very little grown until the late 1980s when it became more prevalent in the nursery trade. Attribution from: Jacobson, Arthur Lee; North American Landscape Trees; ©1996 Ten Speed Press. 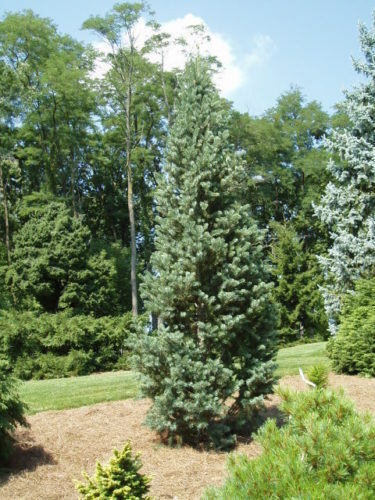 Abies concolor 'Conica' The Harper Collection of Dwarf & Rare Conifers located at Hidden Lake Gardens in Tipton, MI. Photo taken August of 2005. Abies concolor 'Conica' This photo taken at Bickelhaupt Arboretum located in Clinton, IA. Abies concolor 'Conica' photographed at Gee Farms display garden, Stockbridge, MI, in 2009.